Rejoice, rejoice! We are finally at the most exciting month of the year—December, of course! This is the time to put away your weighing scales and look forward to the Christmas goodies and feasts that you deserve for making it to the end of the year. However, December is also a peak period for many restaurants and hotels as both locals and holidaymakers will be taking time off to enjoy themselves. If squeezing with the crowd is not your cup of tea, why not enjoy this festive season in the comfort of your home? To spice things up for your house party, we are sharing exclusive Festive Takeaway Offers. This includes must-haves for Christmas dinners such as homemade pastries, luscious turkeys, all sorts of ham and the ever-popular log cakes! Everyone loves Christmas and we look forward to festive feastings every year. Unfortunately, the annual yuletide celebration is never quite a wallet-friendly event. We know how you feel, we really do. Dining out with the family—especially a big one—is always a pricey affair. But it doesn’t actually always have to be. 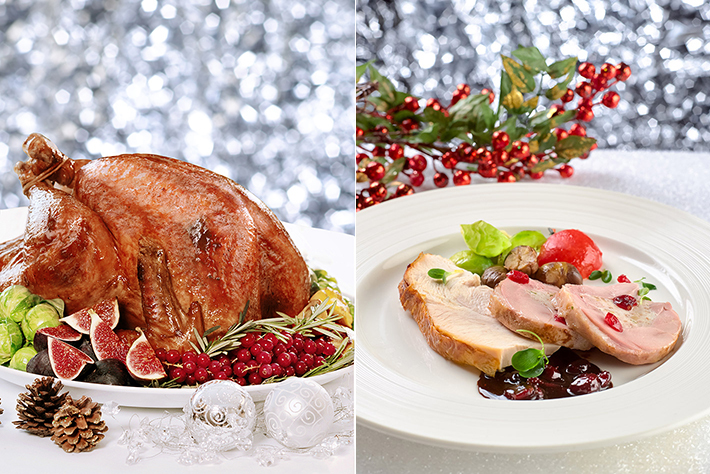 This December, Pan Pacific Orchard, Singapore’s 10 at Claymore is offering a splendid Festive Buffet to our readers at incredibly affordable prices. Simply quote ‘ladyironchef’ to enjoy a Festive Lunch Buffet and Festive Dinner Buffet at just S$58++* and S$98++* respectively for two. In other words, you only have to pay S$29++ each for an eat-all-you-want feast (for lunch). These promotions are reserved exclusively for you, and it is definitely the most value-for-money hotel dining deal thus far. If you have yet to make any plans for Christmas celebration, it is about time you do so! One of the many reasons why we enjoy every visit to Edge at Pan Pacific Singapore is because the all-day dining restaurant takes pride in presenting an engaging gastro-tainment dining experience for all their guests. And every year-end festive season, Edge never fails to delight us with their massive Christmas feast. Our childhood dream came true on our previous trip, when the dessert section of the restaurant was artfully converted into a scene from Hansel and Gretal—with a life-size gingerbread house filled with layers of artisanal desserts. And this year, there will be a different version of the gingerbead house with more new dessert additions! Besides the glorious dessert station, they also have seven ‘live’ food theatres offering Asian cuisines such as Peranakan, Malay, Chinese, Japanese, Indian, Singaporean and dishes from the Pacific region. Yes we know, there are too many choices! Our readers can quote ‘ladyironchef’ upon reservations for Festive Buffet at Edge to enjoy the following offers^: 25% discount for dinner from 28 to 30 November 2016, 20% discount for lunch on Mondays to Saturdays, and dinner from Mondays to Fridays from now until 23 December 2016. If you are one who enjoys an over-the-top buffet spread just like us, here’s why Edge has every reason for your Christmas indulgence this year.